It is Thanksgiving and I write here, off topic, in heartfelt gratitude. Plants and people, life and death, disease and health…seem interrelated. I once had a bamboo flower and lose all its leaves. Even knowing it had to be dead, I could not compost it. I moved the pot and the bare, dead looking sticks to another spot in the yard. I kept an eye on it and occasionally watered it. Years later, it is thriving in- ground along the driveway. Patience and never giving up works for plants, people too. Not always. Other bamboo and different plants I cared about have appeared dead and, left alone, came back. Not all. The splendid Magnolia grandiflora my parents gave me to plant in memory of Norman, my little brother… came back to life after three years of looking dead in the PT garden where it was transplanted. The gardener, who helped mom in her yard, dug the tree up from their yard, bundled the roots and drove the distance to transplant it into my newly designated, Norm’s Memory Garden. I had the pick-ax ready as he dug the planting hole and soon heard the ring of his shovel hitting the native hard clay and rock…about 18” down. I handed David the pick and asked him to loosen the hardpan soil to mix with the enriched topsoil of the garden bed and the rich soil around the tree’s large roots from the fertile ground of its old home. He reluctantly did as I asked. As a brand new master gardener from the Kitsap County Master Gardener course, I learned of a new world of soils, plants, environment and came to understand, love and appreciate bugs and their vital work in our world. Time after time David swung the ax over his head into the hard ground. Finally, he had the depth and width suitable for the large roots to reach out into its new home and I was satisfied. David mixed the soils with the native soil and carefully moved the tree into place. He filled the hole and watered the soil in. Norm’s memory tree was now at home in the middle of the south bed closest to the house. It was beautiful and I envisioned it would one-day tower over and shade the upper deck. Norm’s Magnolia grandiflora tree became a focal point as I worked around the property or glanced out a window. I watched as the beautiful magnolia began to fail, the huge leathery green leaves gradually withered and fell. Norm’s tree began to look dead. Taking the WSU Master Gardener course, I knew the big trees were not easy transplants but still, I left it alone and waited. Day after day, month after month, then year after year I watched and waited. Three years after the transplant, Norm’s memory tree began to form fresh new leaves. The healthy, shiny, thick, huge leaves gained in strength and abundance another year or two until she was splendid in her beauty and began to grow. Yesterday, I saw the green of new growth and inspired by it, wrote this letter to my son and his beautiful, spiritual new wife. New buds spring from the dead and troubled stocks of yesterday. 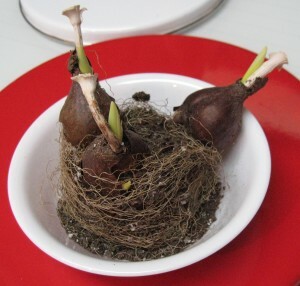 Sprouting from unnourished, dry and withered bulbs, the tiny sprouts grow strong as they form from the old as if to say. Today is a renewed spirit, fresh and ready to write in the smooth sand of a new beginning. Light, joy and laughter does not come easy, but it comes steadily just as sand flows endlessly through the bottomless hourglass of God’s light. Along the way, the flowing sand moves over the rough bumps until they are nothing. Light, joy, love and laughter… a new dawn, a new day, a new begin. God works in mysterious ways and darned if I can figure it out but I do not have to…. I am just grateful He does not give up.